Spicy-food authorities Dave DeWitt and Nancy Gerlach document the chile pepper's history and lore and provide over 180 recipes, ranging from mild to throat-scorching. Beginning in the Western Hemisphere, the authors re-create vanished Aztec and Mayan cuisines, explore Caribbean and Latin American dishes, and travel to the American Southwest for Tamale Pie, Chiles Rellenos Casserole, and Texas Fajitas. They track the chile through Europe and North Africa and then south of the Sahara. India and Burma depend on chiles for the jolt in Tandoori Chicken, Spicy Samosas, and Ginger Noodle Salad, whlie the rest of Asia, too, has succumbed to the heat in dishes like Singapore Chile Crab and Citrus Cashew Lobster. Closer to home, Creole classics--Red Beans and Rice, Crayfish Etouffee, and Andouille Jambalaya--are beloved fiery fare. 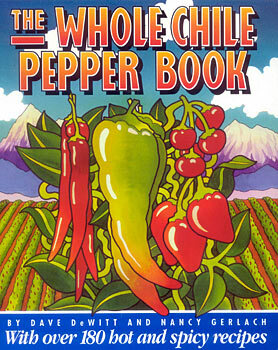 Additional chile-related features include: a field guide with full-color photographs identifying twenty-seven often confusing varieties; extensive gardening and preservation instructions; mail-order and seed sources; the latest health claims; and a special "Whole Chile Pepper Diet." Cooks, gardeners, and the hopelessly addicted will find everything they need to know about chile peppers here. Dave DeWitt and Nancy Gerlach are the editors of The Whole Chile Pepper magazine and authors of The Fiery Cuisines and Fiery Appetizers. Both live in Albuquerque, New Mexico.